Named a Best Book of 2017, from award-winning memoirist and critic, and bestselling author, An Odyssey is “a deeply moving tale of a father and son’s transformative journey in reading–and reliving–Homer’s epic masterpiece. When 81-year-old Jay Mendelsohn decides to enroll in the undergraduate Odyssey seminar his son teaches at Bard College, the two find themselves on an adventure as profoundly emotional as it is intellectual. For Jay, a retired research scientist who sees the world through a mathematician’s unforgiving eyes, this return to the classroom is his “one last chance” to learn the great literature he’d neglected in his youth–and, even more, a final opportunity to more fully understand his son, a writer and classicist. But through the sometimes uncomfortable months that the two men explore Homer’s great work together–first in the classroom, where Jay persistently challenges his son’s interpretations, and then during a surprise-filled Mediterranean journey retracing Odysseus’s famous voyages–it becomes clear that Daniel has much to learn, too: Jay’s responses to both the text and the travels gradually uncover long-buried secrets that allow the son to understand his difficult father at last. 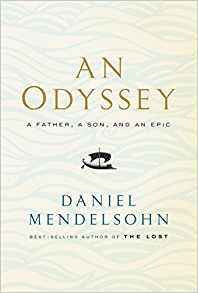 As this intricately woven memoir builds to its wrenching climax, Mendelsohn’s narrative comes to echo the Odyssey itself, with its timeless themes of deception and recognition, marriage and children, the pleasures of travel and the meaning of home. Rich with literary and emotional insight, An Odyssey is a renowned author-scholar’s most triumphant entwining yet of personal narrative and literary exploration. Spoken Interludes. An optional follow-up to this book club meeting will be a reading by the author at Spoken Interludes, a monthly dinner program, held on Friday evening, November 9, at RIVERVIEW, 1 Warburton Ave, Hastings-On-Hudson. Prior to the program, which consists of four, often well-known, authors reading from their recently published books, an Indian-style dinner buffet is available. Dinner is 6:00 – 7:30 pm (arrive anytime); the program is from 7:30 – 8:30 pm (writers read with Q&A); book signing (books are available for purchase at the dinner) is from 8:30 – 9:00 pm. Early reservations are essential; the cost for the evening – $30.00 cash at the door. It is our intention to reserve a table for our book club – providing that we have enough people who sign up for the program. We will organize car pooling for those people who can not drive to the venue. RSVP to Myrna (mwsilville@gmail.com) or Rita (rkapl@aol.com). For more information on the program and dinner, google Spoken Interludes on your computer. Our book for the November book club meeting, on November 15, will be Istanbul: A Tale of Three Cities by Bethany Hughes. This is a lengthy – albeit fascinating – book; try to cover at least half of it.